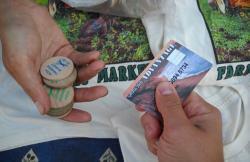 North Coast Growers' Assocation (NCGA) and Food for People partner on Humboldt Market Match, a program through which CalFresh shoppers receive a bonus of up to $5 in free farmers’ market tokens when shopping with a CalFresh EBT card, once per market day, at NCGA farmers' markets in Eureka, Arcata and McKinleyville, or at independent farmers' markets in Fortuna and Garberville. For more detailed information about Market Match, click here to visit Food for People's Market Match page. Food for People launched its Mobile Produce Pantry, a refrigerated truck that travels to remote, underserved rural communities to set up free farmstands that provide fresh (and often local, organic) fruits and vegetables to households in need. All households are screened for CalFresh and assisted with applications, to help provide the resources that make it possible to afford healthy food for a greater portion of each month. 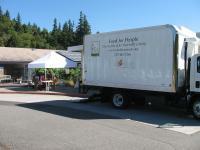 The Mobile Produce Pantry travels alongside the Humboldt County Department of Health and Human Services' Mobile Outreach Vehicle, which offers a variety of county services, including the ability to apply for CalFresh. This successful partnership assists clients with applying for safety net services while providing the fresh, healthy food that helps meet households' immediate food needs. The Humboldt Chapter of Community Alliance with Family Farmers (CAFF) has worked on a number of projects that enhance infrastructure for accepting CalFresh/EBT throughout Humboldt County. They have helped to expand EBT access to Community Supported Agriculature (CSA) farms and farm stands. They focused on farms that distribute or sell produce on site at their farms and can easily process EBT payments with a wireless Point of Sale device that is available from the state at no cost. CAFF assists farmers with the application to become authorized to accept EBT and obtain a wireless device and has helped clarify federal and state language around the criteria for eligible farms. 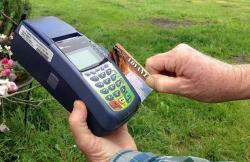 To learn more about the Humboldt County farms currently accepting EBT on their farms, click here. In addition, CAFF has conducted a bread reachign education campaign to raise awareness about CalFresh-accessible farmers' markets. Food for People and CAFF have worked together over the past several years to provide garden growing cards for CalFresh shoppers and potential CalFresh applicants at local farmers' markets and beyond. 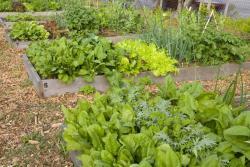 Together, we currently have "how to" cards for growing many different varieties of vegetables and fruits in Humboldt County, both inland and on the coast. Each card has tips on how to get the vegetables or fruits started from seed or seedling, how to care for the plants until they are ready, when to harvest and tips for cooking and preparing the items to eat. The back of each card includes information about CalFresh and local contact info to apply for the program or learn more. Open Door Community Health Centers has created a number of different projects centered on CalFresh Outreach. One is its network of four Wellness Gardens that provide volunteer and educational opportunities for students of all ages to learn about gardening and healthy eating with CalFresh. Some of the produce from the gardens is made available in clinic waiting rooms in Willow Creek, Arcata, Eureka, and their Mobile Health Services van for patients, volunteers, and staff. Under this model, the community is provided with healthy food on site, information on how to apply for CalFresh to get more healthy food, and opportunities to take advantage of the many health benefits of gardening. 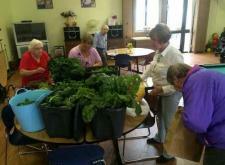 Open Door and the Eureka Community Health & Wellness Garden collaborated with their neighbors at Silvercrest Senior Residences and distribute freshly harvested produce in the Silvercrest dining room biweekly as available. The two organizations work together to screen residents for CalFresh and present cooking demonstrations, showing residents how to use produce from the garden to make simple, healthy meals. Silvercrest residents helped in the first planting of the garden and some are dedicated weekly volunteers. 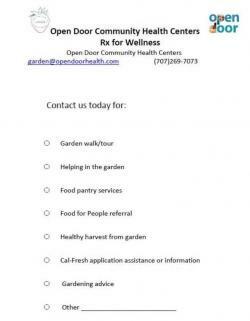 Another of Open Door's projects is the Rx for Wellness program. Their Care Teams are committed to screening patients for CalFresh eligibility and encouraging patients to learn more about access to healthy foods in Humboldt County. Primary Care Providers use the Rx for Wellness template to "prescribe" CalFresh and food resources. And with Open Door's "No Wrong Door" application assistance, all patients are screened for CalFresh eligibility when checking in for a medical or dental appointment. Front desk staff offers income-eligible patients a CalFresh applciation and information about the program. Member Services and Case Manager application assisters follow up with patients to offer assistance in completing the process. The Member Services office is open to all patients and Humboldt community members, and no referral is required. The staff at Open Door know that patients' health and wellness extends beyond the exam room. Child Dental Exam events at the Eureka Community Health Center serve 50-100 children per month. Dentists screen children ages 0-4 for routine oral health exams in a fun and friendly environment, and every family is screend for CalFresh eligibility and offered application assistance. Registered Dental Assistants play nutrition education games with the children waiting for their turn. MyPlate, ReThink Your Drink, and budget shopping displays help families to learn more about health and wellness. All families are provided CalFresh nutrition education materials and a healthy snack. Family and Community Resource Centers across Humboldt County participate in CalFresh Outreach, each in its own unique way. 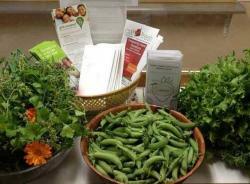 The McKinleyville Family Resource Center food pantry offers CalFresh information at each client contact. The Case Management team assists individuals with filling out the CalFresh application and scheduling eligibility interviews while they are at the pantry or through follow up phone calls afterward. The Arcata Family Resource Center assists the families of schoolchildren by educating on, answering questions about, and assisting with CalFresh at the school's family and parent events. The Center, with the help of community partners, also provides nutrition classes for parents to teach about making healthy, delicious meals on a budget and budget shopping. The Bridgeville Community Center assists clients with applications and questions at the Center and at their on-site food pantry. In addition they promote the various ways clients can access additional healthy food and County services in their region of the county. Mattole Valley Resource Center provides CalFresh resources and application assistance at community events, food distributions, and their weekly playgroup. Southern Humboldt Family Resource Center assists with applications and educates parents on CalFresh and healthy family eating habits. St. Joseph Hospital Community Resource Centers in Blue Lake, Rio Dell, Willow Creek, Loleta, and Eureka provide an array of CalFresh Outreach services tailored to each unique community, including at community events and dinners, First Five Playgroups, focused outreach for Spanish-speaking households, homeless outreach, and CalFresh Outreach and application assistance at food pantries hosted at or by the Centers. The Area 1 Agency on Aging (A1AA) provides unique services, including CalFresh application assistance, to the community of older adults and caregivers in Humboldt County. Services include: Assistance with CalFresh applications, either at their 7th Street Senior Information and Assistance (I&A) office or in the homes of people who have difficulty leaving their homes. They also do in-home Food Security Assessments and provide nutrition-related assistive devices. Another great program is A1AA's partnership with the Humboldt Senior Resource Center to deliver 14 free meals to people who have been discharged from a medical setting, to support healing and prevent return to the hospital. Call I&A at A1AA (707) 442-3763 for more information. The North Coast Community Garden Collaborative (NCCGC) is a support network of and for community gardens, working together to increase access to healthy, fresh, and culturally appropriate foods for all North Coast residents. Community gardens provide land on which people can grow food for themselves, their families, and their community through donation to neighbors and food pantries. Using CalFresh to purchase seeds and starts to grow food maximizes both the economic and health benefits offered by the program. In addition to the nutiriton benefits of eating the produce one grows, gardening offers physical and mental health benefits. The NCCGC's “Food Grows Community” project involves installing kiosk/information boards with CalFresh information at selected community gardens, as well as hosting educational events at local gardens including in-person assistance with CalFresh applications and benefits retention. Events through the “Food Grows Community” project will be happening at gardens throughout the County this fall and winter. All events will be free, open to the public, and offer in-person assistance with applying for and sustaining CalFresh benefits. There are community gardens located throughout the North Coast, and new ones continue to germinate. NCCGC aims to connect them to each other and other local resources. If interested in collaborating with a local community garden, whether for an event or to promote each other’s resources and services, please phone (707) 269-2071, email the NCCGC coordinator, or visit www.northcoastgardens.org. Changing Tides Family Services provides diverse services to children, youth, families, individuals, and the community. CalFresh application assistance is provided at their office (2379 Myrtle Avenue in Eureka) and at various locations throughout the month: at local grocery/retail stores, at community events, and at the farmers’ markets during the summer months. They also provide healthy cooking, active play, and gardening demonstrations to children at licensed childcare providers and to parents and children at local First Five playgroups. Spanish application assistance is available. There are many more partners and projects, which we will update over time. Map of CalFresh Application Assistance sites in Humboldt County: Have you ever wondered which sites and organizations provide CalFresh application assistance in Humboldt County? Visit the Outreach & Contacts page and scroll down to download the map.